This is a partnered post with Weight Watchers to share the sweetness of Peanut Butter Brownie Bliss. I hope your day is filled with much love, friends, family and sweetness. Like many of you, most of my girlfriends have started the new year with a goal of losing weight and getting healthy. This is the time of year when many people start to slack off a bit on resolutions and Valentine’s Day seems like the perfect time to cheat and indulge in a box of chocolates. But I know that if I do, I’ll be feeling terribly guilty tomorrow. Thanks to Weight Watchers, you and I can both indulge in delicious chocolaty goodness without the guilt or sacrificing our diets. 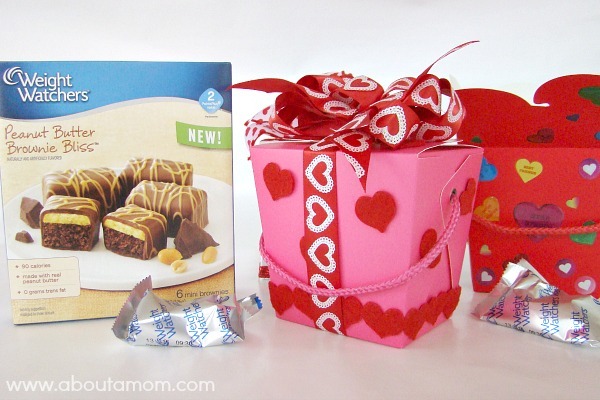 As a special Valentine’s Day gift for a few of my friends, I got a little crafty and decorated some Chinese takeout boxes then filled each of them with individually wrapped Weight Watchers Peanut Butter Brownie Bliss treats. This was such a fun and simple craft project. I decorated the boxes with a variety of things from stickers to heart ric rac trim, and topped each box with a pretty bow. Inside each box I added some paper shred in the colors of Valentine’s Day, and nestled in several Peanut Butter Brownie Bliss bites. As my friends dig down into the paper filling, they will discover more scrumptious treats. Doesn’t that look sinful? I just love that’s it’s not. Happy Valentine’s Day! 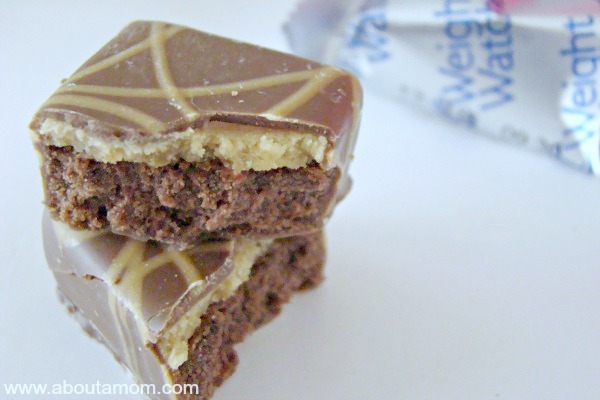 These delicious Weight Watchers sweet baked goods are simply divine. I am totally hooked on them. It’s hard to believe that each brownie has only 90 calories and 4 grams of fat. I think my skinny Valentine gift is going to be a huge hit with my friends. Weight watchers makes some pretty tasty desserts. I have tried a few of them and I was really impressed at how good they were! Those bars look awesome and I love the way you decorated those boxes, great idea! Happy Valentine’s Day! This holiday offers such fattening treats and chocolate, a little skinny I do not mind! Super delicious recipe. Making me hungry but I better grab some fruit first,lol. You had me drooling at peanut butter brownies. Yum! I really liked how you put them in the take out boxes. Slipping in the cupcake liners makes it look really different. ha!! I just got an order of those delivered. SO SO Good!! I love those boxes! And will totally be trying one of those! Yum and WOW amazing, these look so sinful and good! I love the idea to decorate the take-out boxes! I certainly need a box of these for myself. I think being able to have some sweet treats would be a great way to celebrate any day! I use to live off of those treats and they were so good! They worth about 2 points and it was so worth it. YUMMY! Now these I could certainly go for! These look great and I am a big peanut butter fan. I have yet to try a Weight Watchers treat that I didn’t love. My favorite is their candy bar ice cream bars! I would love to have a bite (or two) of those yummy bars! Great way to present them. Those look delish! I will have to buy some to try. I also like the WW ice cream. Pretty Boxes & Such A Great Idea!!! Sinful is right! These look amazing! We went out to eat last night and enjoyed a nice steak dinner! It was lovely! I love my weight watchers snacks. They are delish. I love Weight Watchers. It is great for learning to eat right. I love WW! This looks amazing, never tried this one! Wow, these looked great! We had a very quiet and low key Valentines Day..kinda the way I like it too! Neat way to decorate boxes. Love it! I like the idea of a healthy sweet treat. he idea of putting it in a fancy box to make a gift makes it even more special. We celebrated with our favorite dinner the week before, trying to eat good this week. Chocolate is my favorite sweet treat. You have no idea how excited I was when I found out it is actually healthy for you. I’ve been pinning raw chocolate recipes that have great ingredients that I can try at home too. Thanks for sharing! Now that’s the kind of Valentines Day gift I needed instead of all this candy and junk. I’ve tried several of their products in the past and have always been surprised by how good they are! I need to pick these up. YUM! I love those brownie bliss bites! Great way to stay on plan even with the holidays! These look great, I am sure you cannot taste that they are lower in calories and are better for you either ! Looks delicious, it is good you can indulge without guilt. That was such a great idea using the chinese take out boxes. Very creative and those peanut butter brownie bliss do look really good. Peanut Butter Browning Bliss looks delicious. I’ve had a variety of Weight Watcher products and it’s they aren’t what you would expect. They’re flavorful and satisfying without a bajillion calories! I tend to ‘treat’ myself with low calorie offerings like this when I’m watching my weight. I like that I can still feel like I’m indulging but stay within my calorie limit. It does look delicious, I’d love to give it a try. Thank you for sharing this post. I think these bars look yummy and WOW amazing, these look so sinful and good! 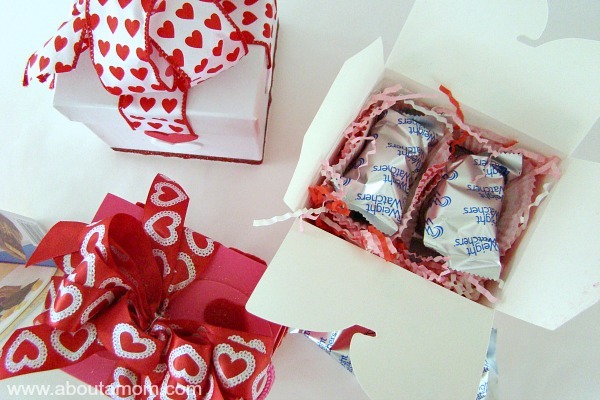 I want to the decorate the take-out boxes, and make these for my family!